Lisa is an International Powerlifting Association(IPA) world record holder in the Amateur Raw Women’s Master (45-49) , 123lb. weight class. In 2013 Lisa founded the USAW-recognized Long Island Barbell Club, dedicated to advancing the sport of weightlifting. Came in 31st place in the 2012 CrossFit Games Open, Masters Women 45-49, out of 797 competitors world-wide. Lisa won the 2015 NPC Long Island Physique Championship. One week later she took 4th at the National Physique Competition (NPC) Atlantic States Championship. Has entered and finished 3 Spartan Races, The Beast (8/11), The Super (9/11) and the Sprint (6/12) Finished the 8 mile Super after breaking her leg at the 6 mile mark. Lisa became a part of the fitness community in 1985 as a personal trainer for Living Well Lady in Brooklyn, NY. 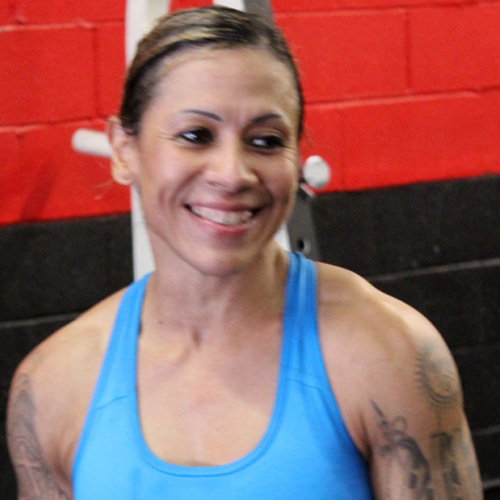 Lisa is a retired New York Police Department Detective who continued down the path of fitness training, staying involved in training police officers in her spare time, attending certification courses and educating herself on the topic of human performance. Lisa has competed in 5K races, The Mighty North Fork Triathlon and in 2001 received the Lion heart Award for her performance during the American Society for Law Enforcement Training’s(ASLET) Law Enforcement Skills World Championship. Lisa was left with nerve damage in her right foot from work-related accidents and a condition known as Reactionary Airway Dysfunction (RADS) from her participation in the recovery effort at Ground Zero after September 11, 2001, yet she continued to train and improve on her strength and conditioning knowledge. Lisa has co-presented at conferences held by the Illinois Tactical Officers Association(ITOA), the Western Canada Officer Safety Conference and the American Women’s Self-Defense Association(AWSDA).